Home » technology » What the WhatsApp end-to-end encryption really means for the everyday user? What the WhatsApp end-to-end encryption really means for the everyday user? Basics: WhatsApp is the world's largest messaging service. There are 1 billion users worldwide. Facebook owns WhatsApp. WhatsApp works in iPhones, Android, Windows, Blackberry and Nokia phones. And there are desktop versions as well. WhatsApp has now rolled out true end-to-end encryption for all users. 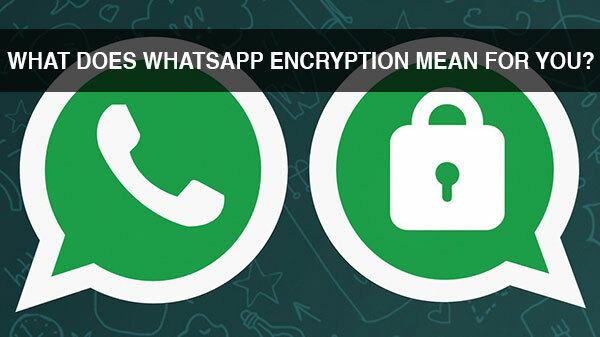 You'll need the latest versions of WhatsApp for the encryption to work. For all users of WhatsApp – every message, photo, video, file and WhatsApp call made will now be completely secure. Totally encrypted. This means that nobody – except the sender and receiver of the message or call will be able to access contents ever - not even WhatsApp employees, governments or government agencies, and no, neither hackers. Security was one of the biggest concerns WhatsApp users had because the solution’s record on data safety was short of expectations. We knew that the messaging application has a history of security breaches. Hackers could often access, say, financial data, sent by you over WhatsApp. No more. Look at WhatsApp's timing this. The encryption comes right after Apple plain refused to create a way into the iPhone 5c belonging to one of the San Bernadino shooters. All Apple devices are end-to-end encrypted, which means, for instance, messages, calls and photos on iPhones cannot even be accessed by Apple. End-to-end encryption is a totally secure way of messaging where only the user and receiver can access messages sent. Eavesdroppers, such as cyber-criminals and hackers, telecoms and Internet providers or governments cannot read communications. No one. "Even the company that built and runs the service cannot access messages, and hence cannot easily cooperate with authorities who request these exchanges." This will not affect how you use WhatsApp each and every time. What it does mean is that it will be much more difficult for WhatsApp to provide law enforcement or other governmental authorities copies of any of your communications, even if requested by warrant, because of the strength of the encryption. Now, unless you really used WhatsApp to plan terrorist activities, it means nothing. If you did, well, it's bad for the rest of us. If you are a hacker who would sniff out sensitive data and use it nefariously, well, you're screwed. For the rest of us, as WhatsApp boss, Jan Koum said "People deserve security. It makes it possible for us to connect with our loved ones. It gives us the confidence to speak our minds. It allows us to communicate sensitive information with colleagues, friends, and others. We're glad to do our part in keeping people's information out of the hands of hackers and cyber-criminals." Freedom's just another word for nothing left to lose. Yay, to WhatsApp. So much hype about nothing. It is a stand against those who invade privacy. It is a good move. Will Facebook also follow with Messaging? No 1. Apple. No 2. WhatsApp. No 3. You and Me.